Just as you were starting to get a handle on the summer routine, Back To School time has peered around the corner. Fortunately, we’re here to help you minimize last minute running around. Whether you’re getting ready for Kindergarten or College this year, be an early bird without leaving the nest. As much as we like fresh, new school supplies it’s no fun dealing with messy, disorganized back to school aisles in crowded stores. Shop online at your convenience for classroom essentials along with some newer, stylish suggestions that we’ve picked! Bring more joy to writing! Experience effortless writing with Paper Mate® InkJoy pens are available in a palette of vivid ink colors! Sharpie® is always uncapping interesting innovations! In more than markers and highlighters –Check out Sharpie Art Markers metallic, neon or permanent marker collections. To get your notes noticed pair Redi-Tag® Thought Bubble Sticky Notes with Mr. Sketch® Scented Stix Watercolor Markers— if they don’t see it they will smell it. Smead® continues the commitment to keep us organized. Best sellers like 2-pocket portfolio folders or textured Leatherette Lockit style. Be ‘green-minded’ with Slash File Recycled Folders ! Nutrition is an important factor in academic performance . 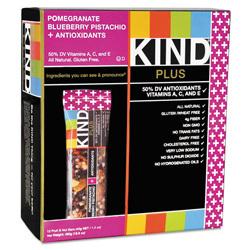 Be kind to your brain with KIND Plus Nutrition Boost Bars! A portable, healthier snack choice come in eight different flavors, keep in locker,desk or backpack as a tasty treat. Remember after you make your purchases to write a Product Review on any of the products that we’ve mentioned! Reviews get you entered in chance to win a $100 Shopping Spree. You will be helping other shoppers with your candid opinion. Happy Back-to-school shopping!